Fresh wild-foraged mushrooms aren’t something you think of as a winter food. We’re talking about real wild mushrooms, mushrooms that are picked in forests and meadows, not cultivated indoors under climate controlled conditions. Yes, wild mushrooms do grow in North America in the depths of winter. Now, as Valentine’s Day approaches, several choice and flavorful wild-harvested mushrooms are in abundant supply. 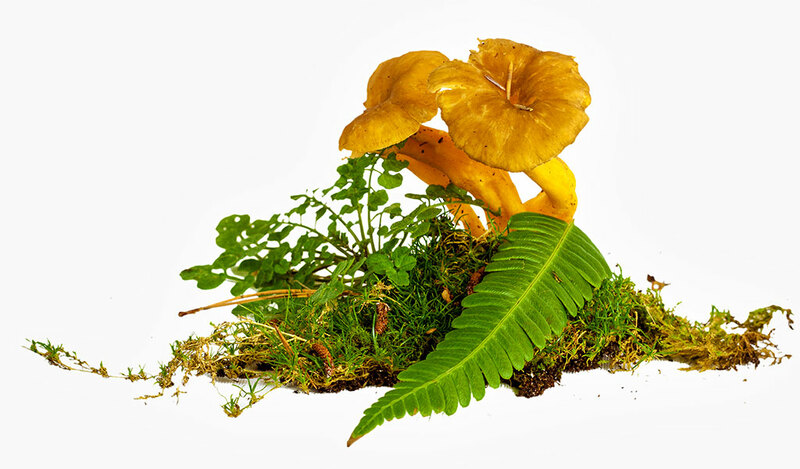 Small, hardy wild fungi such as black trumpets (Craterellus cornucopioides), hedgehogs (Hydnum umbilicatum) and yellowfoot (Craterellus tubaeformis) mushrooms not only grow, but thrive in the cool, moist winter climate of the Pacific Northwest. While not as big and meaty as other prized wild mushrooms, such as boletes and chanterelles, this trio of mushrooms pack plenty of flavor into a small package. 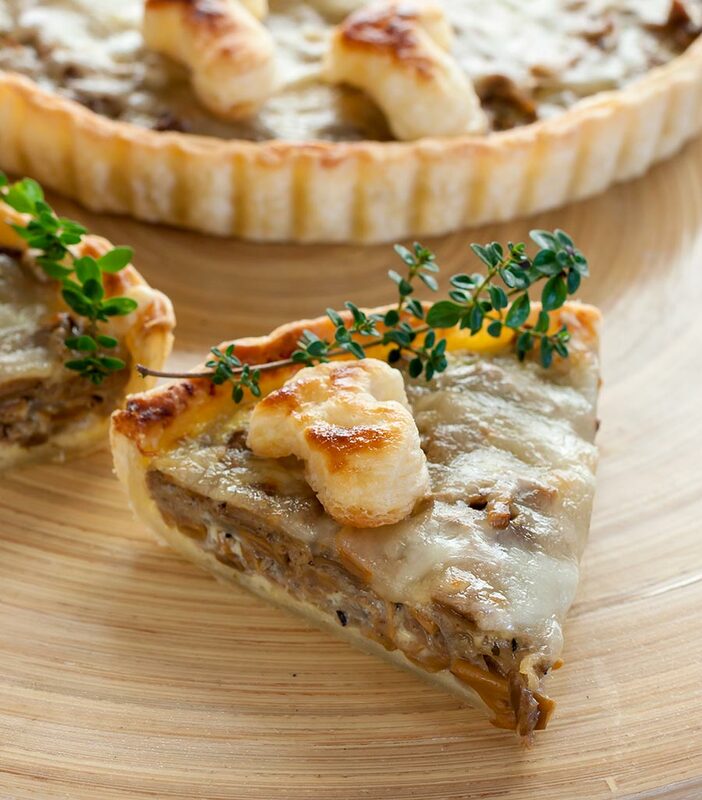 This mushroom tart is a bit different from a quiche. It’s not nearly so eggy and contains fewer ingredients in the filling. It’s all about the mushrooms. 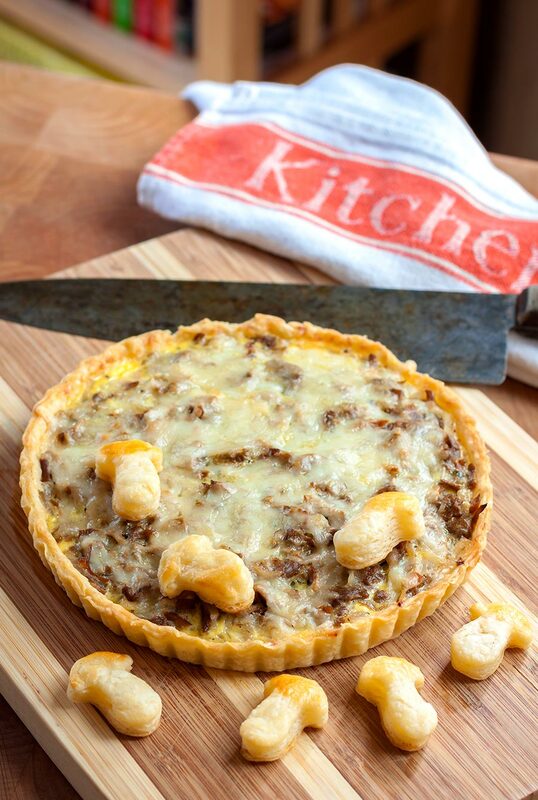 The crust, eggs, cream and grated cheese accentuate their rich, earthy flavor, but they’re mainly there to hold the mushrooms together in a neat, buttery package. 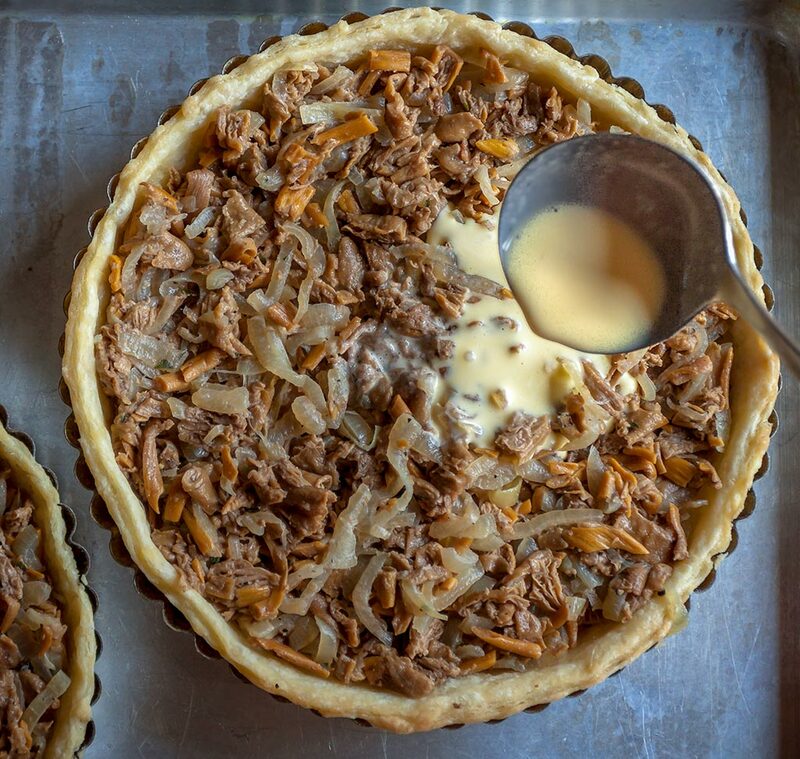 This delicate tart is delicious when served warm from the oven, but the flavor of the wild mushrooms actually becomes deeper and more intense if its allowed to cool to room temperature. We’ve used fresh yellowfoot mushrooms for our tart, but you could use any winter mushroom, or a blend of whatever is available (even store-bought cultivated). Many winter wild mushrooms are full of moisture, so make sure your mushroom mixture is quite dry before adding it to your pre-baked pie crust. Pour or spoon off excess liquid to speed cooking time and avoid overcooking the mushrooms, but don’t discard that flavorful liquid. It’s pure culinary gold, so save it for use in soups, sauces or gravy. Preheat the oven to 375F and lightly grease a 11-inch removable-bottom tart pan or equivalent. (We used two 5 inch pans.) Roll out the pastry on a lightly floured work surface and line the pan. Refrigerate for one hour to chill the dough. Using a fork or sharp knife, prick the bottom of the chilled pie crust in several places. Place a sheet of parchment or wax paper over the crust and fill with uncooked rice, beans or pastry weights and bake in the preheated oven for about 25 minutes or until the edges are light golden brown. Remove from the oven, take out the weights and paper and check to make sure that the bottom of the crust is cooked. If not, return to the oven, minus the weights and cook for a few more minutes. Take out of the oven, place on a rack and allow to cool. Melt the butter in a large pan, stir in the onions, cover and cook on low for 15 – 20 minutes, stirring from time to time. Add the mushrooms and thyme and continue cooking uncovered until the liquid has reduced, about 10 – 15 minutes. If you have too much liquid, pour or spoon it off (reserving it for use in soups, sauces or gravies) and return to the heat until the remainder has evaporated. Season to taste with salt and pepper. Pour the milk and cream into a bowl and beat in the egg and yolks. Fill the crust with the mushroom/onion mixture, spreading it to the edges. Pour over the beaten milk and eggs and sprinkle the grated cheese over the top. Bake for 15 – 20 minutes or until set and slightly firm to the touch. Remove from the oven and allow to cool. Serve warm or at room temperature. Put the flour and salt into a food processor. Add the butter and pulse to cut it into flour until the mixture resembles coarse meal or bread crumbs. Add the ice water and pulse for a few seconds, just enough to form a soft dough. Remove the dough and press it together into a thick disk. Don’t knead or overwork the dough, which can lead to a tough crust. Wrap tightly in plastic and refrigerate for at least 2 hours or for up to several days. Remove from the refrigerator and allow to warm slightly to cool room temperature before rolling it out. Roll the dough to a thin round a couple of inches wider than the diameter of your pan. Lay the dough loosely into the pan, letting it relax a bit. Gently press the dough against the edge of the pan and carefully trim a little higher than the pan. Refrigerate or freeze for an hour or so before pre-baking.